Women are leading the way towards the recovery of earthquake-affected communities in Nepal. Nearly 750,000 buildings were damaged or destroyed in the earthquakes in early 2015, leaving families in temporary shelters and students learning in makeshift school buildings. Rebuilding this infrastructure so that it does not collapse again in a future earthquake takes more than just bricks and money. Access to professional engineers and trained builders, along with other information on safe building techniques, are all crucial to rebuilding safer houses and schools. So, how do people in rural areas – often with unreliable transportation and communication systems – gain access to information and trained professionals to help rebuild their houses and schools? Technology is changing the way people can access these resources, and women are emerging as leaders in this field as well. Khusbhu Gupta is a Computer Engineer and Programmer who has been contributing to post-disaster data collection and monitoring through the FULCRUM Mobile App, an offline data collection and monitoring tool used by Build Change to monitor ongoing construction of rural housing in accordance with the government housing codes. FULCRUM provides engineers on-site with real time recommendations for construction, based on the data they observe and input, helping them to monitor the construction quality. It also records technical details of houses along with GPS locations and photos. Not only does the app support construction of individual houses, it also provides an overview of on ongoing construction sites to staff and project managers at the Kathmandu office, without them having to travel long distances between sites and the office. Staff and project managers can monitor construction quality, staff location, and project progress from the office, making the system extremely efficient and productive. Khusbhu oversees all of the data entered and output in the app, and ensures it runs smoothly. 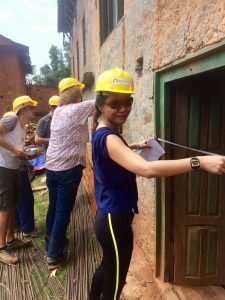 She has been instrumental to the consistent, efficient lines of communication from Build Change field-based staff and the Kathmandu office, which has in turn supported the construction of hundreds of safer homes and schools around the country. With her help, homeowners and school leaders will continue to have access to the information, engineering support, and technical assistance they need to rebuild their homes and schools to disaster-resistant standards. We are so lucky to have Khusbhu on our team, and cannot wait to see the exceptional work she will continue to bring to our team. Due to her outstanding work in data science, she has also been awarded with full scholarship to pursue Master in Data Science at Mahidol University in Thailand. Congratulations to Khusbhu on her great achievement! Meanwhile, we are pleased to know that we have Mohita Joshi will be taking over Khusbhu’s responsibilities while she studies. 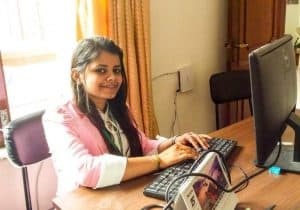 Mohita has her masters in Technology Computer Science and Engineering from National Institute of Technology, India, and has over 5 years of experience in data management. We are so proud to have another female Program Information Officer on our team. The female technical staff we work with every day are some of the most passionate leaders we have encountered, creating positive impacts in their communities through leveraging their skills and experience. To Khusbhu and all of the amazing women out there changing the world: thank you for your inspiration and dedication to building a safer world, one building at a time! 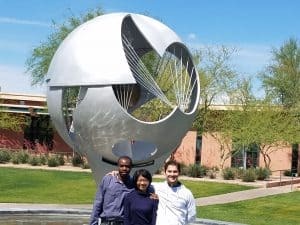 The American Express (AMEX) Leadership Academy is an annual training program which was launched in 2009 at Thunderbird School of Global Management at Arizona State University through a partnership with AMEX. More than 270 managers from over 90 organizations have been served and benefited through the program. The curriculum focuses on the skills needed to run a successful nonprofit, while recognizing cultural nuances and molding specific lessons to different nonprofit niche needs. Each program targets up to 30 emerging leaders from around the world. Three Build Change staff attended the program in early 2017: Haiti Program Manager Gaspard Pierristal, Indonesia Program Manager Mediatrich Triani Novianingsih, and Lead Structural Engineer for the Philippines Carl Fosholt. Each took away important lessons that are advantageous to their leadership skills and styles both in Build Change and as young professionals developing their careers. According to Gaspard, he “learned how to coach effectively by asking the correct questions to understand the reality of the person, and help find solutions without being given the answer”. 1. The Leadership Versatility Index (LVI) is a tool that helps discover strengths and weaknesses in order to act on them, as well as finding a balance between the two. LVI uses the 360 method to comparing feedback “full circle” and improves results through leadership. The framework accounts for the complexities of the manager’s job and focuses on finding a balance. The Global Mindset Inventory (GMI) offers tools that help to discover weaknesses in your global mindset and abilities to work on them in a way that will lead to a stronger ability to adjust your influence on those in varying cultures. GMI was developed by the Global Mindset Institute as an assessment tool to help determine the ability of global leaders to better influence others unlike themselves. Learn more about GMI and take a sample survey. Identifying different communications strategies, and how to use them with various stakeholders, is an important step in the leadership process. As Margaret Mead said, “Always remember that you are absolutely unique. Just like everyone else.” Remembering that everyone has a different way of communicating, and different modes of communication that they respond to best, is imperative in honing your leadership technique. Your colleagues, supervisors, and employees will all be individuals with different communication styles and preferences- it is your job to learn from them and adapt effectively. Organizations and businesses must also contribute to the society in which they function. During his time at the AMEX Leadership Academy, Carl had the realization that “it is a privilege for an organization to operate within a society, not a right”. Businesses and organizations must participate in all aspects of society, not just those that support their goals. Incorporating an understanding of social standards and priorities into your leadership style will help develop a deeper understanding of how your organization interacts with its surrounding social, economic, and political contexts. A truly strong leader is flexible in the techniques that they use with their team and will find the right balance to lead the team, given the specific circumstances in which they are operating. Leaders are nothing if not flexible and adaptable, especially in the ever-changing landscape of the nonprofit sector. Did you just stumble upon a prospective funding opportunity, but the proposal is due tomorrow? Or perhaps your project timeline is progressing slower than anticipated due to factors outside of your control, and the various stakeholders are getting impatient? Circumstances will rarely be ideal, however every team will respond to stress, deadlines, setbacks, and accomplishments differently. As a leader, accepting your team’s responses and working with them – not against them – will help the team get through the hard times and celebrate the good times without additional stress. An estimated 500,000 houses are only partially damaged after the 2015 earthquakes in Nepal. That means out of 750,000 houses estimated to be damaged or destroyed, 2/3 of them are still standing but cracked and unsafe for people to use. These homeowners are not in need of newly constructed houses, but an opportunity to save as much of their original house as possible and strengthen it through retrofitting. Retrofitting is an innovative and cost-effective method of seismically strengthening existing houses by strengthening structural elements and stabilizing the current structure, making them earthquake resistant. An estimated 2.5 million lives would be made safer from future earthquakes if these 500,000 homeowners are aware of and choose the option to retrofit. Not only would millions of people be safer, but in the process an estimated 30 megatons of construction materials and 1 billion USD in reconstruction costs would be saved as well. Most houses in rural areas of Nepal have similar layouts and are built using traditional, local materials and methods. 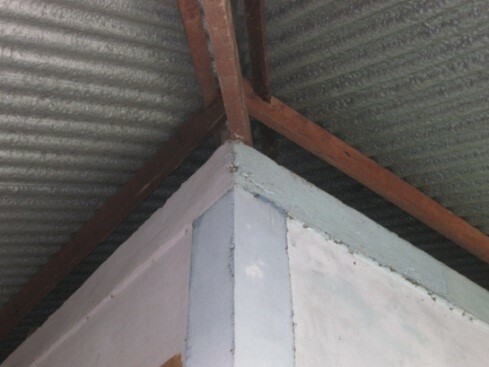 Because of this, Build Change has been working with the Government of Nepal to develop and test a specific ‘pre-engineered’ retrofitting type design, applicable for much of the housing in the mountainous country. The goal is to simplify the retrofitting process, so that it is a more accessible and feasible option for the 500,000 homeowners who could retrofit rather than rebuild. So, how can we make the process so efficient and accessible that homeowners can’t ignore the possibilities? The Autodesk team at a technical support center in Nepal. In early June 2017, seven representatives from the Autodesk Foundation and one from Team4Tech arrived in Nepal. The 8 of them had some questions to answer to develop a deeper understanding of how communities were affected by the disastrous earthquakes that struck the country in 2015, and how rebuilding efforts were going. The Autodesk Foundation supports the design and creation of innovative solutions to the world’s most pressing social and environmental challenges. They provide support through grant funding, software, technical training, and industry expertise to grantees in architecture, engineering, product design and manufacturing, visual effects, gaming, and related fields who are creating solutions to environmental and social challenges. The Autodesk Foundation has been working alongside Build Change since 2013, providing suites of software licenses, trainings, grant funding, and remote technical support for a variety of program areas. Now, this team of top technical experts has added to the generosity of Autodesk and the Foundation, leaving their families and lives to travel to Nepal and volunteer their time to aide in the reconstruction efforts. Team4Tech facilitated this exchange between Autodesk and Build Change. Their mission is to advance the quality of education in developing countries by connecting technology volunteers and solutions with high impact nonprofit organizations. Since 2013, they have connected over 230 volunteers from 18 technology companies to more than 34,000 students and teachers around the world. Given their extensive expertise and dedication to supporting safer, more efficient construction practices, the team naturally came to Nepal with some questions. How can retrofitting become a more efficient process? Can designs be improved, so that more homeowners have access to safer retrofitting options? Can we develop tools to safely accelerate the process of field data collection and retrofit design? How can Autodesk technology be leveraged to support this goal? 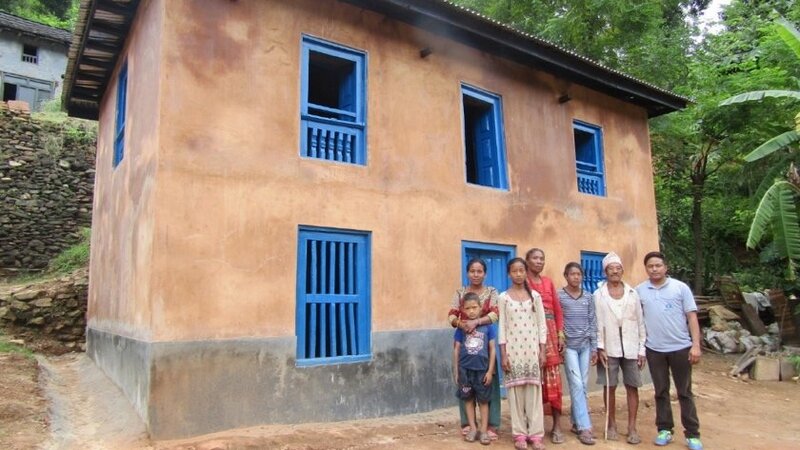 Retrofitting is a relatively new approach to safer construction in Nepal, especially in rural areas, which means the design process is often long and time-consuming. Retrofitting a single-family house requires weeks for engineers to go into the field, take measurements, and finish safe, custom designs. Upon hearing the potential of retrofitting for homeowners in Nepal, the Team4Tech and Autodesk volunteers were ready to help Build Change make the process more efficient, without sacrificing safety. The team used the Human Centered Design (HCD) technique, an innovative approach to problem solving which incorporates a human perspective as a part of process. 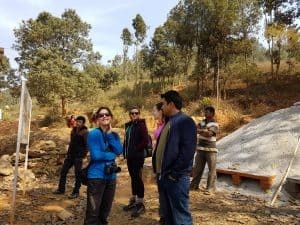 In order to fully understand the situation in earthquake-damaged areas in Nepal, the team first set out to gain firsthand knowledge and develop a deeper understanding of the existing retrofit processes by traveling to communities where homeowners are currently working with Build Change to retrofit their houses. The team traveled to Sindhupalchok district, one of the areas hardest hit by the earthquakes, where they observed and took measurements of ongoing retrofit projects and spoke with community members and engineers advocating for retrofitting. They also conducted a series of HCD workshops, providing tools and exercises for Build Change field staff and others involved in earthquake recovery in the area. The team also tracked and mapped Build Change’s relationship with its stakeholders to identify existing and future opportunities for retrofitting and understand the existing relationships better. Build Change staff in a Human-Centered Design workshop. The result of this two-week investigation and collaboration was a tool which is already making the Build Change retrofitting program more effective. 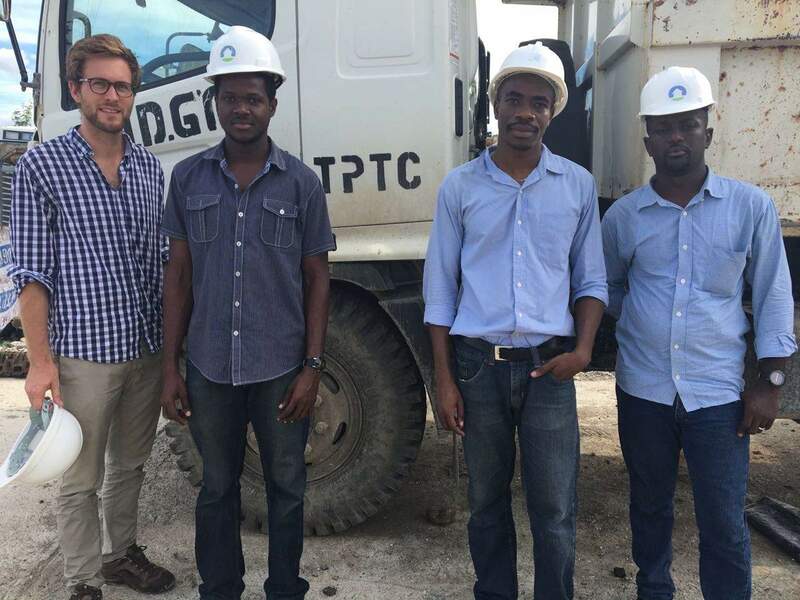 The HCD techniques and methods helped the team develop a shared understanding of the day-to-day challenges engineers face both in the field and the office, and what it takes for them to take accurate measurements and create accurate designs. Using this as a base, the team was able to propose a solution: a 3D modeling tool which helps to simplify, accelerate, and ensure quality for the retrofitting design process. This has already helped Build Change raise the profile of retrofitting as viable alternative for reconstruction, and widened the potential support to homeowners. In the future, the goal is to make the retrofitting process and techniques so easy to use that anyone with a basic understanding of construction could use it to generate a retrofit design for their own home. 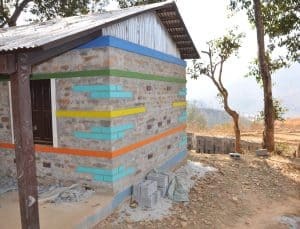 This collaboration between 3 organizations with separate, yet intersecting, expertise represented a massive growth and development for both team members and earthquake-affected homeowners in Nepal. 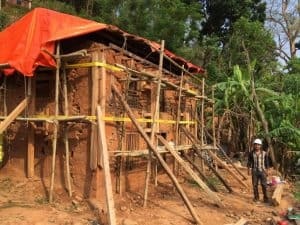 Organizations such as the Autodesk Foundation and Team4Teach help strengthen our vision of homeowner-driven reconstruction and safer building practices in Nepal and all countries where we work. We look forward to continuing to share our developments and experience with the 3D modeling tool created by the Autodesk and Team4Tech team. Subscribe to our newsletter or bookmark our blog to stay up to date! ©All photos provided courtesy of the Autodesk Team. It’s been 2 weeks, nearly to the day, since I returned from Nepal while I am writing this -although it’s hard to tell precisely given this is the third time zone I’ve been in during that time- but I do know that I’m 2 weeks late in writing this blog. Admitting my tardiness is exactly why the experience of the RMS Impact Trek is of such value. We all have day jobs and commitments that absorb most of our time and it is a rare opportunity to be able to step outside our daily routine, to learn about something new, experience a new part of the world and talk with people whose passion and commitment to the work they do might just inspire us to try and contribute however we can and perhaps challenge our own routine or ways of thinking more often. 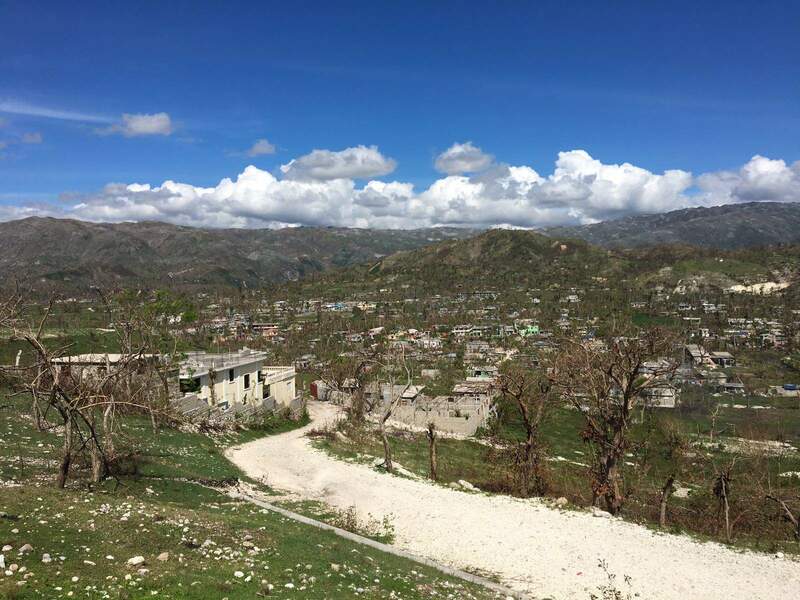 Build Change has been the cornerstone of RMS’s CSR agenda for the past 4 years, starting with Impact Treks in Haiti, moving last year to Nepal. We’ve also just announced our continued support for the work Build Change do over the next 5 years. The annual RMS Impact Trek is an opportunity for RMS employees, and for the first time this year RMS clients, to see first-hand the work that Build Change does, see first-hand the way they approach building resilience, supporting and empowering a network of organisations, working directly with local communities, promoting the idea of home-owner driven rebuild and retrofit as well as engaging with the government and local authorities not just in Nepal but in all the countries in which they work. Each of my fellow Trekkers is writing about their experiences and thoughts on the work Build Change do so I wanted to try a present an overview of our time in Nepal. 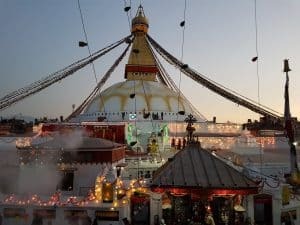 Most of the 8 trekkers arrived in Nepal on Sunday the 5th and spent that afternoon seeing the some of the world-famous sites in Kathmandu such as Pashupatinath Temple and Bouddhanath Stupaa, and also just getting to know each other. On Monday morning, we climbed into the two 4x4s that world carry us around for the next few days and headed to the Build Change office to meet with Noll, the country director in Nepal who would be our host for the week. We spent the morning talking and learning about the earthquake nearly 2 years back, the work that Build Change do, how they operate both immediately following disasters through to the years of reconstruction that follow. I think it’s fair to say all of us were shocked by the scale of the problem the country still faces. That afternoon it was off to the field, driving out of Kathmandu to Dolalghat, we were to stay for the next 2 nights in a small guest house on the Araniko Highway. Build Change rent out the whole building for all their employees who spend much of their time in the field. The next day we headed to across the river Indrawati to Bhimtar and Eklephant (Sangachok region) both nearly completely destroyed by the earthquake to see Build Change’s work in action, visit construction in progress, walk around the villages to see how people now lived, talk to engineers, other NGOs and locals alike. People working on construction sites. We returned to our guest house late in the afternoon talk over our experiences and for the brave few of us to swim in the very cold Indrawati – much to the amusement of the locals, who explained only children swim in Nepal. The following day we would we would return to Sangachok visiting a local school and a technical resource centre Build Change has set up and talk to more of the local community. That afternoon we returned to Kathmandu where we would spend the next two days in the Build Change office, meeting more of the team, learning about the work they are doing with the civil engineering department at the local university, meeting with visitors to their office, talking with staff and volunteers on a wide range of topics from their use of drone and areal Imagery to micro-planning of the villages they work within. It was in this last discussion, talking with Adam a volunteer at Build Change, that really struck me. Adam showed me the images I’ve include below. This is Bhimtar, a place I’d walked through just a few days before, before and after the earthquake. It struck me how the entire layout and structure of the village has changed, temporary housing sprawls out around where the houses once stood – to me this really highlights how Build Change aren’t just focused on building back stronger more resilient houses but in working with the local community rebuild their future and make the most of the resources they have. The final weekend was spent seeing more of Nepal; visiting Bhaktapur, hiking to Namo Buddha Monestary (a unique opportunity to see inside a Monastery with young Buddhist Monks performing their daily rituals) and hiking back down in the mud and rain. The final Sunday also provided the opportunity for us all to see and take part in Holi, the Hindu spring festival, also known as the “festival of colours” which the photos of us smiling while covered in paint and water show is very appropriately named. The energy, enthusiasm and hospitality of the Build Change team during this entire trip was inspiring. The work they are doing is impacting directly the lives of those whose homes they are helping to rebuild but they also have a much bigger vision – attempting to change the opinion and operation of disaster relief and response to put retrofitting and home-owner led engagement at the front of the agenda. It was a privilege to take part in this years impact trek and to see how Build Change aligns with RMS’s own goals of helping to create resilience to natural disasters. Women play a crucial role in post-disaster reconstruction. In Nepal, where the population is 51% female, this has become especially apparent. Many women have taken on new roles and responsibilities since the earthquakes in 2015, and are at the forefront of permanent reconstruction efforts to build a safer future for their families, communities, towns, and cities. At Build Change, we have always placed a special emphasis on working with, hiring, and training women in the traditionally male-dominated fields of engineering and construction. Currently, 37% of Build Change global technical staff is female (compared to an international average of 11% of the engineering sector being comprised of women). In Nepal, we have 16 highly qualified, dedicated engineers leading reconstruction efforts, working on anything from handling field operations to quality control and implementation. The best part? All of our female engineers in Nepal report to our Lead Structural Engineer, Liva Shrestha, who in turn reports to our Director of Engineering, Lizzie Blaisdell Collins, who finally reports to our Founder and CEO Elizabeth Hausler. A reporting structure completely comprised of women…in what is still potentially one of the most male-dominated sectors in the world. In honor of International Women in Engineering Day, we’d like to introduce you to some of these talented women. We hope they inspire you as much as they inspire us every day! Purnima Acharya is a field-based Staff Engineer with Build Change in Nepal. She works in close coordination with the Lead Structural Engineer, Liva, and is responsible for overseeing operations, solving problems, and generating solutions in the field. 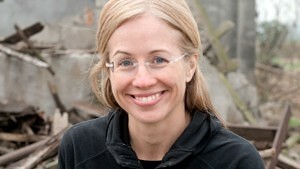 She assists homeowners, builders, and other partners in designing and supervising the reconstruction and retrofitting of earthquake-resistant houses. 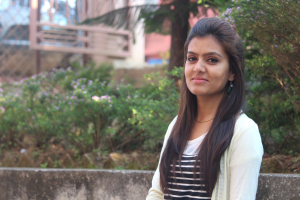 For International Women in Engineering Day, Purnima shares her experiences as a female engineer and some lessons from the field. 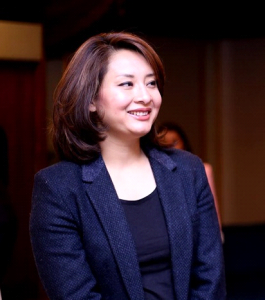 Liva Shrestha is the Lead Structural Engineer with Build Change in Nepal. She oversees quality control of design information and implementation for all of our projects in Nepal, and works in collaboration with Lizzie, our Director of Engineering. She is also responsible for making sure that technologies and solutions are consistent with Build Change’s philosophy of earthquake-resistance, sustainability, and cultural appropriateness. Liva went through many similar situations as Purnima. She spoke to us about the socio-cultural constraints of working in the field that was widely perceived as a “man’s profession”, and how she overcame this challenge. Lizzie Baisdell Collins, S.E. is the Director of Engineering with Build Change, overseeing the quality and consistency of engineering and technical project solutions for all Build Change programs globally in close collaboration with the Chief Executive Officer (CEO). She has worked extensively on earthquake-resistant design and evaluation projects in highly seismic regions since 2005. Elizabeth Hausler, Ph.D. is a skilled brick, block, and stone mason with an M.S. and Ph.D. in Civil Engineering from the University of California, Berkeley, an M.S. in Environmental Science from the University of Colorado, and a B.S. from the University of Illinois at Urbana-Champaign. This ultimately led to her founding Build Change in 2004, which now operates in 7 countries worldwide. 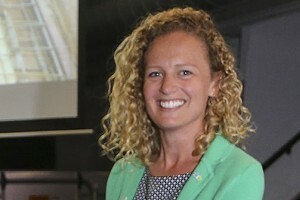 Elizabeth has been honored with many awards and titles for her outstanding contribution, including a 2017 Skoll Award for Social Entrepreneurship, 2014 Academy of Distinguished Alumni of the Civil and Environmental Engineering Department of University of California, Berkeley, 2011 US Social Entrepreneur of the Year by the Schwab Foundation, and 2011 Lemelson-MIT Award for Sustainability. She is also a 2004 Echoing Green Fellow, a 2006 Draper Richards Kaplan Fellow, a 2009 Ashoka-Lemelson Fellow, and a Fulbright scholar to India in 2002-2003. Purnima, Liva, Lizzie, and Elizabeth have become role models for so many women aspiring to pursue careers in the field of engineering. These amazing women, along with the many other women engineers, builders, builder trainers, and homeowners we work with, are changing the world, one safer building at a time! Hello, dear reader from the future. Perhaps you’re reading this without context, so allow me to set the scene. In March of 2017, RMS invited me, an unsuspecting client, to join their Impact Trek to Nepal. 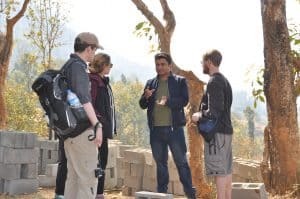 Seven other trekkers and I visited Build Change, an organization whose Nepali operation seeks to help improve construction and retrofitting practices in the villages struck hardest by the April 2015 Gorkha earthquake. 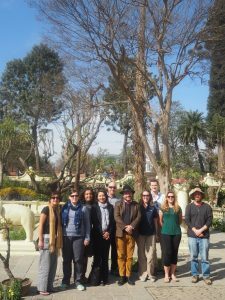 We toured some of those villages and regrouped at Build Change headquarters in Kathmandu. If, after reading the piece below, you want to know more, send me a message. Or read some of the other blogs. If writing about music is like dancing about architecture, what does that make writing about architecture? Um, tedious? Some of the trekkers were (somehow, unbelievably) lulled to sleep by the violent rocking of the vehicles that transported us along some of Nepal’s finest mountain “roads.” But hot jostling cars don’t do it for me. Despite being educated as a seismologist, I’ve found almost no better sleep aid than discussions of structural engineering. My attention span for earthquake engineering details is shorter than the time you just spent reading this sentence. At the risk of committing heresy, I’ll say it: buildings are boring. So when the rest of the trekkers headed to the labs at Kathmandu University to see how walls are stress tested, it wasn’t only anti-social tendencies that led me to stay behind at Build Change HQ*. Build Change in Nepal has data. Duh. Build Change in Nepal has many different ideas for data products. Build Change in Nepal has many different target audiences for those data products, and each audience requires a tailored message. But Build Change in Nepal has no fixed priorities or detailed plan for developing data products. (I suspect that you could replace “Build Change in Nepal” with the name of most non-profit organizations in the world and the same statements would apply.) 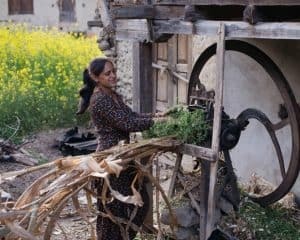 Having no set priorities is not necessarily a bad thing; in the case of Build Change in Nepal, it just means that the development is being driven by the interests and skills of those involved. Let me tell you, then, about two relevant data sources. Uttam testing the drone before aerial mapping commenced. 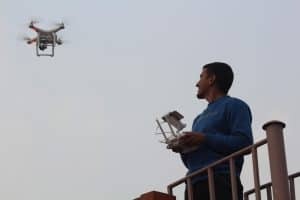 One of the activities that Build Change in Nepal is pursuing is 3D modeling of the villages where they’re involved; to this end, they’re conducting drone flights and experimenting with different camera settings. This is happening because Uttam, one of the Build Change dudes, is interested in drones. (My empirical research indicates that so are most dudes in the world. Oh, and when Uttam is not busy at Build Change, he’s running his own startup.) Turning the image data into a 3D model is not a huge challenge, and Uttam can simply choose one of several available software packages to do so. The resulting models can be used to plan rebuilding and, in places where it’s possible to make repeat flights, give a very rough idea of construction progress. Build Change in Nepal has also conducted several surveys and tracked construction progress for every house with which they’re involved (2000+ at the time of this writing. One of these surveys collects information about each construction site—for example, the distance to the nearest source of water—and another, a homeowner preference survey, allows Build Change to identify gaps between the types of dwellings that villagers want to live in and the types of dwellings that the federal government has approved. These data are stored in a database and cry out for visualization. At my day job analyzing natural catastrophe models, one of the things I commonly do is visualize data stored in a database. Hooray, I can help! So, in the coming weeks and months, I’ll be working with Khushbu, an energetic student who is already engaged in extracting some of the survey and progress data for internal reports. (In her spare time, she’s pursuing a Master’s in sociology. When do these kids sleep?) We’ll prototype an interactive map capturing results of the homeowner preference survey and construction status. 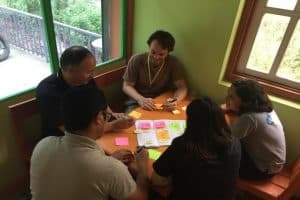 We’re hopeful that this pilot project will show Noll and others what is possible with the data that Build Change in Nepal already has, and that it will jump start discussions around planning and priorities for the future of data at Build Change. * I once lived w/ a dude who conducted state-of-the-art rock mechanics experiments, but our conversations revolved around water balloons, Napoleon Dynamite, and roasting coffee. And I don’t even drink coffee. 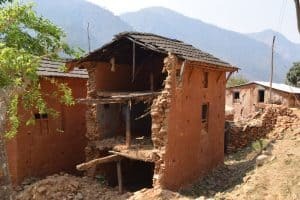 Having just returned from the RMS Impact Trek in Nepal I felt encouraged to write about the tremendous work which Build Change is doing following the devastating earthquake in April 2015. My awareness of the charity only really came to light when RMS announced they would be organizing the impact trek and choosing three clients to take with them. I was lucky enough to be one of those three. But this fact has also resonated how lesser known the charity is, especially in the insurance sector in which we work. Given my naivety, my assumption of Build Change was rather simplistic. 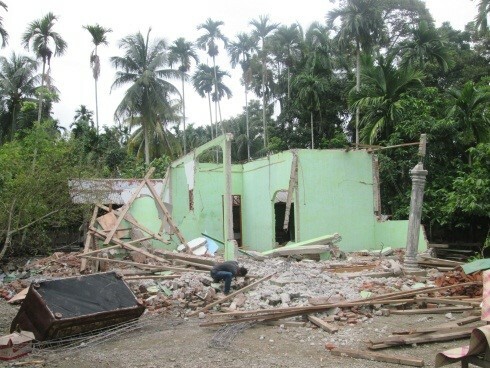 Typically in the relief efforts following a natural disaster, international agencies respond by reconstructing buildings and critical infrastructure which has been destroyed in a catastrophic event. What often happens in these situations however is that the decisions and reconstruction efforts are determined by these external agencies and often rarely involve the people who are going to live there. A further issue arises where international agencies have a much wider access to resource and where their construction practices may not necessarily be sustainable once the international funding comes to an end. This issue is further inflated in countries like Nepal whose varied and extreme terrain requires a much more diverse consideration for culture and building practices. Build Change’s vision is much more holistic and focuses on building resilience by working at the local home-owner level, using local materials, local resource and local capability. The charity seldom builds constructions for homeowners (only in instances where on-the-job training can be incorporated) but rather works alongside them assisting with the technical expertise and knowledge required to build earthquake resistant structures in the rural and often isolated villages of the Kathmandu valley. Further to building new constructions, Build Change actively promotes retrofitting partially damaged homes. This is hugely important for home-owners who do not have the capacity to finance a new construction and is something which the Nepalese government does not currently consider. What was also incredibly impressive to see, was the knowledge and expertise of the Nepali structural engineers employed at Build Change. 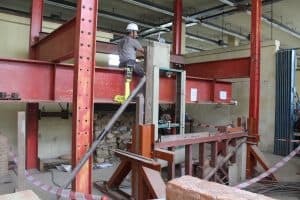 We were kindly invited to the engineering lab at Kathmandu University to see how they stress test these retrofit designs before they are implemented in the field. This academic involvement provides confidence in this new retrofit concept for Nepal. Build Change is making a remarkable difference in building resilience. Being engaged at the local level is extremely effective and is enabling permanent change which can be sustained. But to scale this up to a national (or even international) level is probably the most difficult to achieve and involves working with the government to enforce building codes or altering the current vulnerable building practices. A further challenge which Build Change highlighted was the lack of Insurance penetration in Nepal. The insurance industry provides a vital role in development and this is a well known concept in the development community. But providing the right financing and risk transfer mechanisms is often difficult and lacks the traction it needs to get it off the ground. But with the right thought and consideration I’m sure this issue can be solved and would be a huge achievement across the developing network. I hope that raising this awareness and the work of Build Change can go some way towards this solving this issue. On our first day in the field we headed up to Bhimtar, a rural fishing community about 45 minutes from the main road and where we are staying. Bhimtar was badly impacted by the earthquake, with most houses completely destroyed. Since the earthquake occurred just before midday on a Saturday, most people were down by the nearby river and children were not in school. All buildings in the village were destroyed, killing most livestock, but fortunately human fatalities were limited to the few people who had stayed inside. Looking around the village it’s difficult to see where the original houses once were with rubble mostly cleared, but there is the occasional glimpse of where a wall once stood traced out on the ground. Now, the temporary structures that people are living in are made of corrugated metal or wood and are dispersed more widely. It’s hard to imagine living in these temporary homes for almost 2 years, but this year has seen the first wave of government funding enabling homeowners to rebuild. With only a few months until the monsoon begins, the construction season is short, but it’s exciting to see new permanent homes starting to rise up across the village. 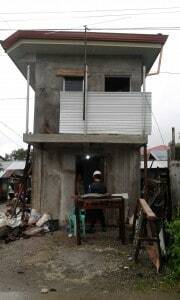 To meet requirements to receive a government grant after the earthquake, homeowners must meet building code, but with costs much higher than traditional rural building techniques, and the grant only covering around 50% of the cost of the new construction, rebuilding using earthquake-resistant methods is often cost-prohibitive for homeowners. 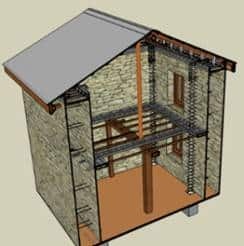 The first house we saw under construction was a confined masonry building, an innovative and more affordable design that Build Change have been instrumental in advocating and seeking approval for. 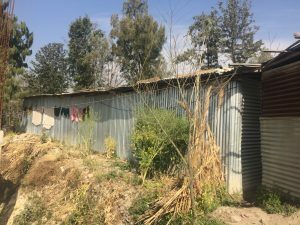 As we walked around the village, we passed many more confined-concrete buildings beginning construction, with a wide cross-section of the community working together. Men and women, young and old, were involved sharing the heavy labour. Concrete is mixed by hand, and in the more remote communities, cement and rebars need to be transported in by foot. We had a go at shoveling and carting a few barrow-fulls of dirt, which left us sweating and exhausted. Although we weren’t much help, we managed to provide some amusement to the locals, who took over our photo-op, snapping some pics on their phones and having a good laugh at us. in addition to the subsidy is much lower too. Retrofitting has other advantages including lower environmental costs compared to a new build and allowing families to maintain a more familiar home and lifestyle (often using the ground floor for livestock and top floor as a grain store) than the new single story construction houses. Build Change have been working hard to have the value of retrofitting recognized by the government in Nepal, and the new subsidies that are now being provided as a result will lower the financial burden of re-building an earthquake-resistant house, and allow more homeowners to go back to their homes. Build Change’s focus is to support homeowner-driven construction, so these types of cost-effective approach are extremely important to enable these rural communities to recover. It’s an exciting time for reconstruction in Nepal, and it will be great to see the progress that is made by the next Impact Trek! At 11:56am on 25 April 2015, Central Nepal was hit by a massive earthquake (7.8 magnitude), causing devastation to many parts of the country. Luckily it happened when many people were not in their houses so the number of casualties was small compared to the number of destroyed or damaged houses. 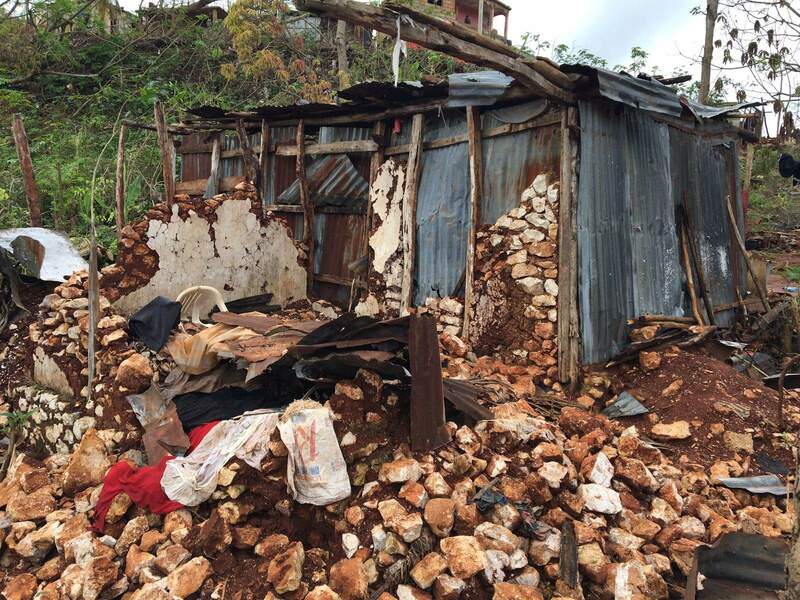 During the RMS Impact Trek in March 2017 I didn’t expect to see lots of houses still highly damaged neither many people (4 million) still living in temporary shelters. Almost 2 years after the earthquake! 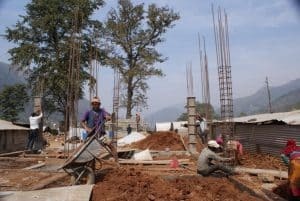 Rebuilding lost homes and livelihood is a slow and drawn-out process in an under-developed and bureaucratic country like Nepal. For villages completely flattened by the earthquake rebuilding houses from scratch is the only option. Construction codes are not always applied. “This is how it works in the informal economy: someone constructs a building without official authorization or planning approval. The builder meets an inspector in a café. Coffee is drunk and cigarettes are smoked, some money changes hands, and now there is a certificate to show that the building is ‘authorized’ and complies with the regulation (Robert Muir-Wood, The Cure for Catastrophe)”. There is a gap between construction code & real needs of people. This is because the components of building regulation are not integrated in a holistic manner, and there is no common set of risk or safety levels underpinning the building performance requirements. Homeowners are not consulted during the design & rebuilding process and are often assigned to a new house they don’t want to live in it. For damaged houses a valuable option to consider is retrofitting, a series of techniques aimed at strengthening older buildings to make them more resistant. Retrofitting can be used for both damaged and non-damaged buildings, in the latter case for prevention. 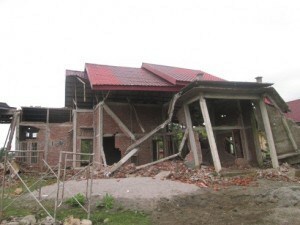 The Government in Nepal seems to favor demolishing old damaged houses and building new houses. But people (especially in the villages) are not happy with this approach. Homeowners may not want to live in places where the new houses are built or cannot afford to live in a new-built house with same characteristics/dimensions of the previous one. For example, with the money provided by the Government it would be possible to build only a very small ‘safe’ house while homeowners are typically used to live in a big 3-story house (100m2), for hosting cattle, living and storing food. Homeowners would just like to go back to their previous-but-safer house. House in Eklephant (to be retrofitted). But there is also a difference in risk-cost-benefit relationship between new and existing construction. Sometimes it is more cost-effective (or easier?) to implement risk mitigation measures when designing and constructing new buildings as compared to retrofitting existing buildings. So, the overall picture is quite complex. This is, in a nutshell, how Build Change works: not building or retrofitting safer houses but instead teaching and transferring such knowledge to the local community, for a lifetime. Build Change starts from the need and demand of the local population. New technologies are introduced during the retrofitting work but those technologies must be affordable in order to have a sustainable shift in building design & performance. During the entire RMS Impact Trek, I looked at / thought of the many challenges of a poor country like Nepal affected by a natural catastrophe. With a single question in my mind: what can we do to make places like Nepal more resilient? 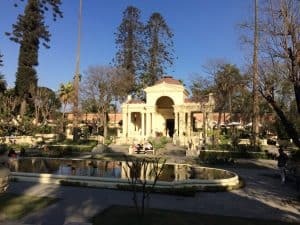 Kathmandu – Garden of Dreams. Build Change is contributing to include retrofitting in all the standard practices for safe buildings and is making a mindshift at the decision level to assess post-catastrophes damages. This is a long path but it will slowly put more attention on prevention rather than post-catastrophes from the public / private sectors and decision makers. RMS & the insurance industry can play a big role in jointly designing alternative transfer risks products, microinsurance, etc.. & entering new markets. While there is probably not enough demand for property insurance, agricultural insurance is a great potential to low-income farmers and their community. Market-based solutions could include providing lower premiums if farms have been retrofitted, for example. RMS & the insurance industry can benefit from the in-depth knowledge of the local community provided by Build Change. And you, reading this blog & listen to the experience of your colleagues, can bring awareness to the people around you, helping to bridge the protection gap and contributing to a more resilient society. After several days in Nepal, including two days in the field, my views have changed. My assumption was that everyone was building new homes to replace those destroyed by the 2015 earthquake, and that these new homes would be better, safer, and more capable of serving the needs of the people that lived in them. I thought this was simply an issue of technical skill, logistics, labor and material resources, and money. But the truth is more nuanced and complicated, and Build Change is tackling the issue of home retrofitting. According to Build Change, retrofitting these damaged homes can be cost effective and provide the same space that existed before the home was damaged, in some cases far more than a new home. Because of a lack of funds, new homes often need to be smaller and that impairs how people use their homes as a residence and as a source of income. Multi-story homes provide shelter for people, food and animals that new home solutions often struggle to provide. Build Change is helping to provide the technical expertise, training, organization and planning to make retrofits a potential solution for the government, NGO’s and homeowners. Winding through all these challenges takes both expertise and persistence that is exhibited in the staff at Build Change. It’s not an easy job, and I found the thought of rebuilding or retrofitting tens of thousands of homes overwhelming. However, my sense of the staff at Build Change is that they are not overwhelmed, but desire more resources to provide help more quickly. Some homes of course need to be completely rebuilt from the ground up. 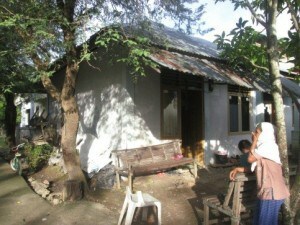 When we visited the village of Ektephant, we saw several new homes under construction. Those connected to Build Change were being constructed by people trained to build homes to code, with proper materials, and with proper techniques. To further help these small communities, Build Change is working on micro planning to help home spacing, use of land, drainage, and a feeling of community. What are the future challenges? I think it will be funding, certainly, but it will also be the ability of Build Change to lead and not be daunted. Have you ever thought about building your own house? Not just selecting the finishes, assembling IKEA furniture, or maybe laying a bathroom tile or two. I mean really starting from scratch: removing soil, mixing concrete (by hand), tying steel rebar, laying blocks… Would it change the way you felt about the building? Now imagine doing this in the wake of immense tragedy while you are living in a temporary shelter. This is exactly what is being done in villages across Nepal. But how? And why? Scenes from a rural construction sites. 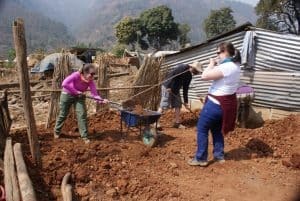 My interest in participating in the Impact Trek (aside from the once-in-a-lifetime chance to visit Nepal and to see the Himalayas, which had been a dream of mine for years) was to witness firsthand how local people were being empowered by Build Change to reconstruct their communities. 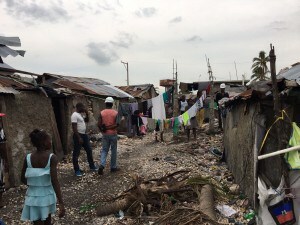 As someone with both personal and professional interests in catastrophe risk and disaster management, it can be confusing when there are so many aid organizations that exist in the “resilience” or “safe housing” space – how can you know which ones are making a real difference in a community thousands of miles away? I had many questions and, admittedly, a healthy dose of skepticism before I left for Nepal: I was nervous that we would witness the plight of regions affected by disaster and then aided with rows and rows of donated houses built by external experts and left empty. Five years ago I walked away from a university project in community and environmental development on the Eastern Cape of South Africa with an appreciation for the importance of engaging local communities in long-term change efforts, but I had little experience in housing. Through RMS I had learned that Build Change was “homeowner-driven.” In my initial understanding, this meant that the homeowners were somewhat involved in the decision-making process for the retrofitting or reconstruction of their home. I didn’t know just how involved they were, or how critical it would be to the success of Build Change. I looked forward to the trip but was still concerned on what we would see. The use of locally available resources is important for construction materials, but also for the construction process! Bamboo was a popular material with which to build scaffolding. Flash-forward a few months. The “light bulb” moment was when we were in Bhimtar village, at our second construction site for the day and the first that wasn’t a model home. I saw multiple generations of men and women working together to move soil, dig foundations, and fasten perfectly spaced steel ties to re-bar. An elderly man navigated a wheelbarrow full of stone across the construction site, deftly balancing the heavy load. Someone in the distance mixed a large pile of concrete with just a shovel. In the hot sun, three women in brightly colored skirts swung pickaxes into the earth and paused to glance curiously at our group. Two things were clear: that building houses without what we would consider modern construction equipment is really tough (obvious), and that I should go to the gym more often (obvious now). It was an impressive scene. Homeowner-driven. It clicked. This is what it means to be homeowner-driven. Women play an important role in construction efforts at all the sites we saw. Here a woman takes a break from breaking up soil for removal to check in on the progress of the rebar installation. Why is this important, and what are the outcomes? Knowledge sharing and trust. With a government subsidy for funding and training from Build Change, the people in these villages are really building their own homes, from the ground up, together with their families. This means that Build Change is not just providing an asset. 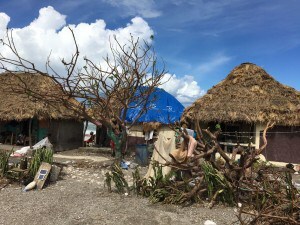 Instead, they involve the community by training builders so that the homeowner can rely on someone locally to help them construct a safe house – then not only is there the obvious outcome of an earthquake-resistant home, but now there is a community that has done this once and therefore should be able to do it again. Down the road, should another disaster strike, they’ll be able to rebuild. Or, the same homeowner and builder could decide to expand the house to meet a family’s growing needs in a way that is safe. By enabling local people, the knowledge stays in the area and can continue to grow and spread. Cultural sensitivity. 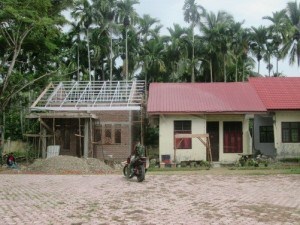 The type of house is critically important to the various cultures and ethnic groups within the diverse country of Nepal. We heard over and over again that Build Change wants to adhere the designs to the local practices, such as designing homes that fit the need of grain storage on the upper floor, as much as possible. Houses need to be culturally appropriate: if everyone in the village has a wood house, and we start building reinforced concrete – it doesn’t matter how much “better” or safer we say the house is. It doesn’t fit in, it’s not respectful of local culture, and it might not be trusted by local people. Noel told us that they’ve seen examples of culturally inappropriate houses used as animal sheds. A new house is not any safer if it’s empty. The construction we observed was a community effort, and though sometimes the sites did seem to get a bit crowded, everyone played a part. Here, the men gathered have formed an assembly line to bring water to the foundation for it to be mixed with cement. Empowerment. This is a decision the homeowners have to balance against a lot of other day-to-day priorities: these are often people on the lower end of the economic spectrum in their respective region and so they may have to weigh things like healthcare, or transportation, or any other need. But they’ve made the decision together with their family and they have come to agree that the best use of money is to invest it in a safe house. Therefore, the family becomes very committed to the result – the involvement from the start means that people understand why they are doing or checking for certain qualities, they make sure they’re doing it correctly, and then they can enable to entire community to replicate it. If a program doesn’t start with the homeowner, they may only leave behind a house instead of a fully engaged and educated community. 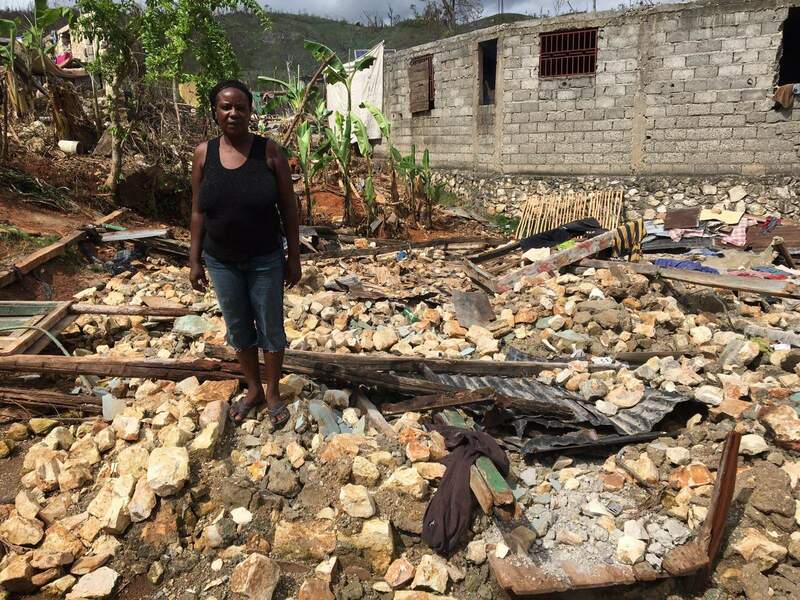 After realizing why being homeowner-driven is so important to reconstruction efforts, I can’t imagine the impact of what it is like for the people here to build their own homes, to make the difficult decision to spend a critical amount of money and take family safety into their own hands. I can only venture that I would feel empowered and strong, maybe nervous, but certainly resilient. Looking back, I wish I had asked Arun to ask them what this feels like. I hope that I can use my experience to tell others about the importance of Build Change and what’s happening in Nepal. The takeaway for me is that Build Change is enabling the people we saw not just with houses, but with homes. Homes that can be replicated across villages, in a way that makes sense for the people who live there. Homes that village residents feel responsible for and that they feel comfortable in. 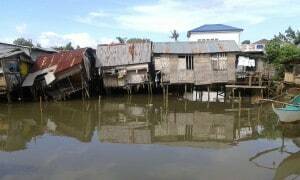 Homes that will help them to regain their livelihoods and live safely for generations to come. That’s so much more than just a house. From February 23 to February 25, 2017, Carl and Linnel from our engineering team in the Philippines performed post-earthquake reconnaissance following the 6.7 earthquake in Surigao Del Norte, on the north side of the island Mindinao. The team investigated and documented the response of rural school buildings and informal urban housing in the area, which will help inform our retrofit efforts in Manila and further our understanding of the seismic vulnerability of school buildings. 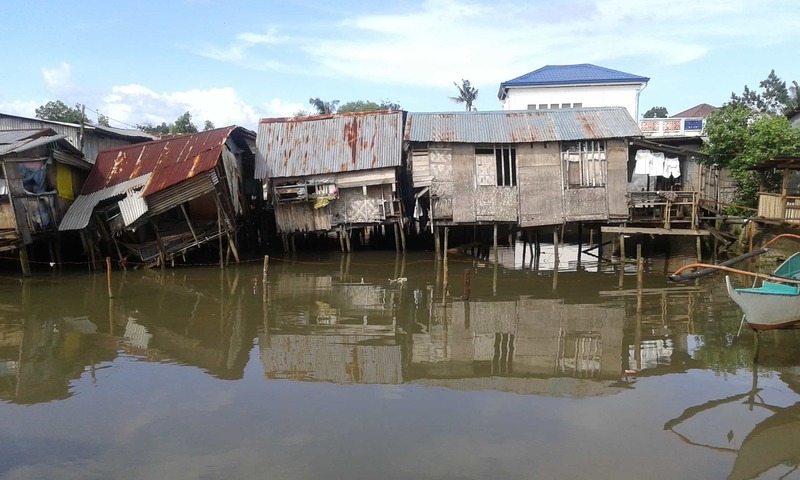 The highest concentration of damaged housing exists in Surigao City, and San Francisco has experienced the most significant damage to schools. Unfortunately, San Francisco is inaccessible due to collapsed bridges and damaged roadways, and the team’s efforts have therefore been focused in Surigao City. Surigao City is a moderately dense city with a population of about 160,000 people. The team flew into Butuan on Thursday, about 4 hours south of Surigao City as the Surigao airport was closed (the runway sustained substantial damage requiring the suspension of service). Many large scale commercial buildings, hotels, and hospitals of masonry construction in the city area have been closed due to sustained damage. 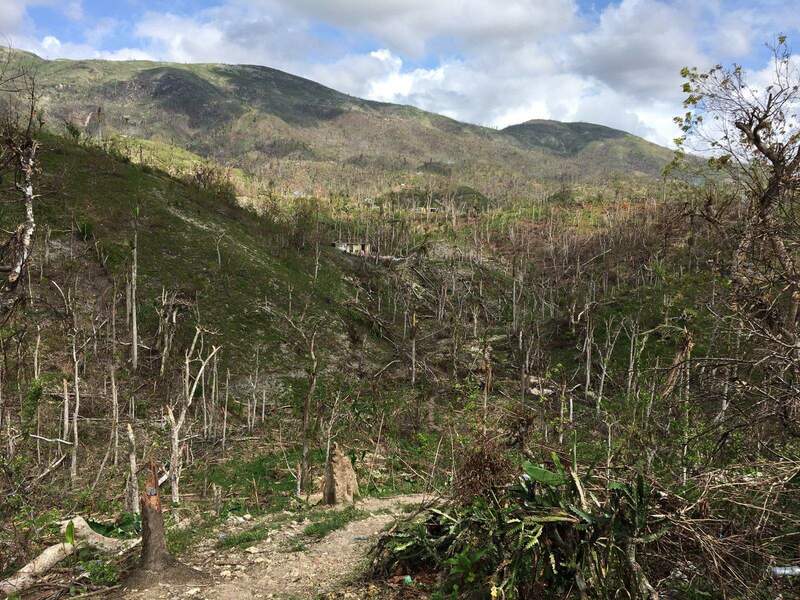 The Build Change team coordinated with the Provincial Disaster Risk Response Management Office to locate the most heavily impacted areas. 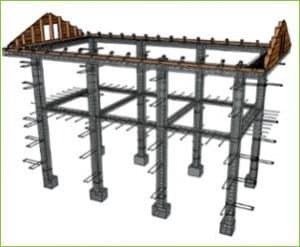 They have observed and encountered a wide range of housing typologies including unreinforced masonry, infill masonry, masonry skirt wall, timber post with masonry infill, lightweight timber, and masonry ground story with timber upper-story construction. The majority of homes are limited to 2 stories or less. 2 story masonry infill construction experiencing permanent tilt due to settlement of foundation. Example of good construction above grade but inadequate foundations. Minor wall cracking on 2 story masonry infill construction. Neighboring buildings were heavily damaged and ground ruptures were visible, although building foundation did not exhibit damage. Example of good construction and good building response. The team observed damage in all building typologies, however only in buildings that exhibited noticeably substandard construction were severely damaged or collapsed. 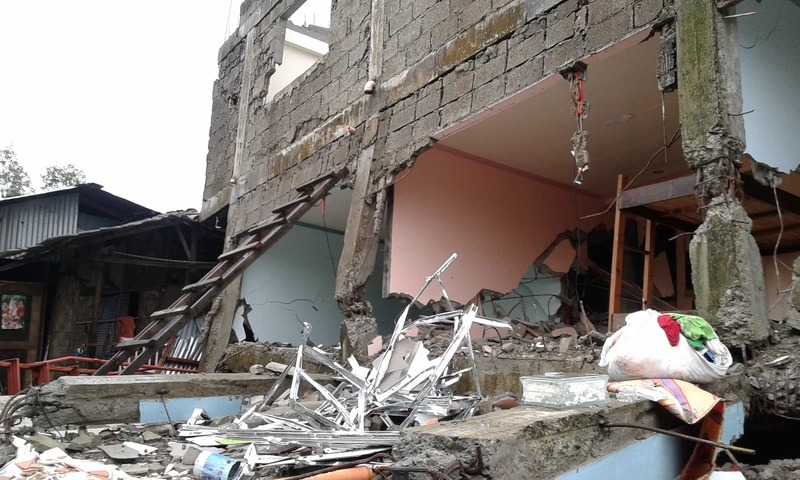 Encouragingly, buildings that used common Philippines construction practices either experienced minor damage or no damage at all, even when neighboring homes were completely destroyed. 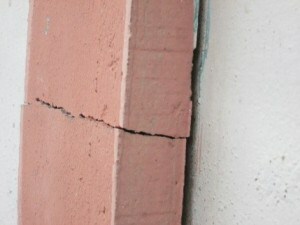 The most common failures for masonry construction were out of plane wall failure. The most common for timber was soft story failure and a lack of complete lateral system. The team completed their reconnaissance on Saturday, February 25 and returned to Manila. The results and observations will be used to continue development of retrofit manuals for urban environments such as those in Metro Manila. Today we had a chance to join the government team that conducts assessments for school buildings. Their team is divided into three groups, each with an engineer from the Ministry of Public Works, and a representative from each of BPKP (Financial Investigation Agency of Aceh Province), BNPB, and DepEd Pidie Jaya. The team will assess 54 schools that are reported to have high or moderate damage by the school staff. 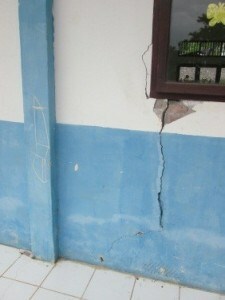 Schools which are deemed highly damaged will be demolished and replaced with a temporary emergency school. 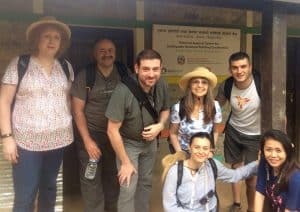 We split our team into two, Danny and Didi went to assess some nearby villages, and Ani joined the government team for school assessments to learn how the government assessment process works. Ani and the government team visited 5 schools. 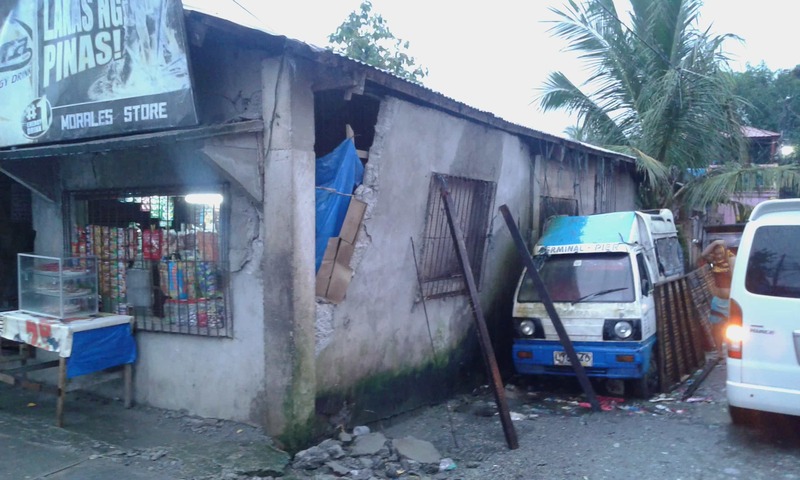 Some schools showed no damage (or no new damage) due to the earthquake, even though the building was reported to be highly or moderately damaged. We did find damages similar to those we had seen elsewhere, including collapsed gable walls and cracking near openings and at wall-column connections. There was a long crack in the side walls and gable walls, found at all schools and a similarly designed library building. Few buildings had collapsed. The engineers from the Ministry of Public Works do not use any forms or tools during assessment, and instead identifies what is missing, pieces that need to be added or repaired, and categorizes the damage accordingly. They will classify a building as highly damaged if the structural frames are broken or have collapsed. Our second team went to two additional villages in Trienggadeng sub-district: Tampui and Peulandok Teunong. Tampui is more remote, near the forest in the hills, but still easy to access. We found about 50% of houses in the area are timber framed. The majority of houses sit on stilts and look to be about 50 years old. The columns are not on the foundation on many of these houses, and nearly 75% of the houses in the villages are damaged. 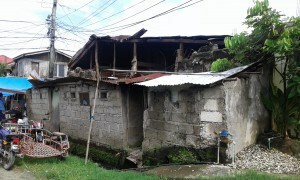 Most of the damaged houses are confined masonry. 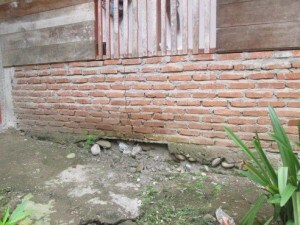 We found similar problems here as with the confined masonry houses in other villages: building height (floor to ring beam) was about 4 meters or more and had no other reinforcement in the wall, short connections between the rebar of columns and beams, insufficient concrete cover, poor concrete quality, and improper bricklaying techniques. All houses use CGI roofs and timber roof framing, except several old timber framed houses that use sago palm for the roof. There are still many people living in tents in front of their houses, afraid to go back inside. On the last day, we visited two villages in Peukan Bada, in the Aceh Besar district, where we provided technical assistance in 2006. We visited houses in Lampisang and Keuneu Eu villages, some of which were not under our technical supervision. All of the homeowners did not make any changes to the houses since they were built, except for one house (Jamal) which had been expanded to the back and rear. The other two houses extended the roof at the front. We did not see any major damages to the houses, and the structure frames are still in good condition. The only damaged we found at two houses was the plastering or covering of some columns had chipped off, but the rebar remained unexposed. 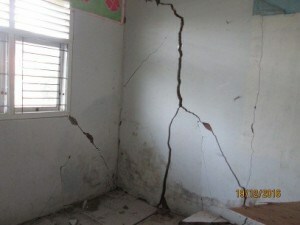 We found two houses with cracking near the openings or windows, however according to the homeowners the cracks have been there since around 2007 or 2008. The roof structure and coverings are also still in good condition with no leakage reported. The wall paint is also still looking fine and has not been repainted, despite thin cracking lines on wall surfaces at two houses. 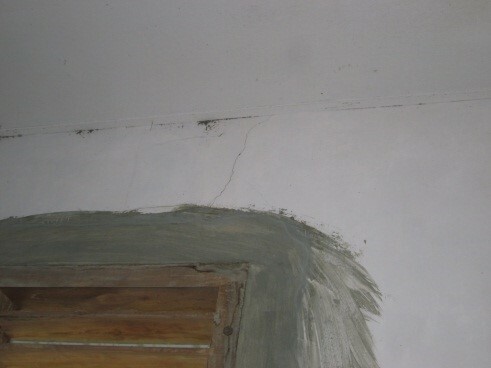 The only major damages we found on all houses is the wooden window and door frames look rotten. All of the homeowners still remember Mercy Corps and Build Change, and one of them even still has set of drawings of her house. We shared our bluebook with them as well. Today we visited two more affected sub-districts in Pidie Jaya. In the morning we went to Bandar Baru sub-district and visited two schools. The buildings are confined masonry, and include teacher housing. Walls have collapsed in a few of the classrooms and the library building. The damage that we found in those two schools are quite similar to the damage at the schools we visited earlier in the week: cracks in the walls near windows and doors, and separation between columns, beams, and walls. One of the buildings with teacher housing has metal roof framing and metal sheet roof covers. 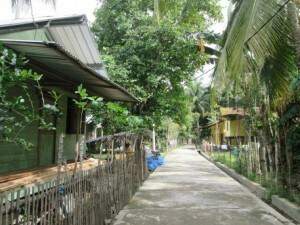 We then went to Jie-jiem village, one of the most affected areas in Bandar Baru sub-district. 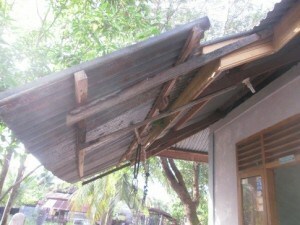 According to the village leader, there are 77 damaged houses- about 60% houses in the village. The majority are confined masonry houses, and none are more than one story. 35% are timber framed houses, or are combined with a confined masonry portion. There was more damage found in confined masonry houses, however some of timber frame house have also been damaged. 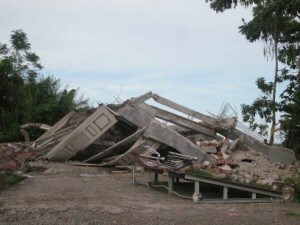 They had one school that reported damage, but it had already been demolished by the time we arrived. Building materials are not easily accessible- many people prefer to get their bricks from the Bireuen area (6 hours away). The village leader and some homeowners whom we interviewed are very interested in good construction practices. We gave them some of our bluebooks to help support their reconstruction efforts. We also visited two villages, one in the Meredeu sub-district, and another in the Trienggadeng sub-district. There are still a lot of people stays in the tent or camp in both villages. The one in Meredeu is much denser than the one in Trienggadeng. 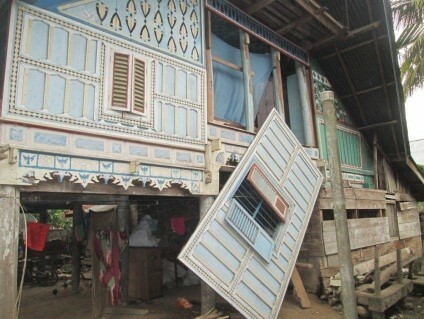 About 50% of the houses in Meredeu were timber framed, while in Trienggadeng nearly 70% were confined masonry. 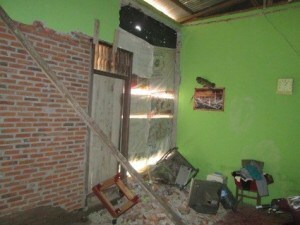 The damage to the confined masonry houses, however, was more obvious in Trienggadeng. We only have a general overview of these two villages, as we did not assess any individual houses. We met one brickmaker in Mee Pawang village, in the Trienggadeng sub-district, and visited his kiln. 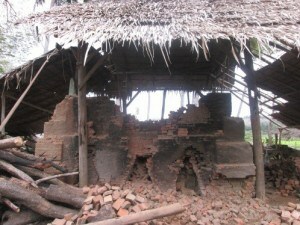 The kiln is badly damaged due to the earthquake. 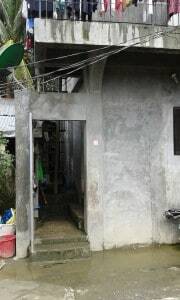 It is similar to the ones used in Lhokseumawe, but the wall is lower (around 1.5 meters tall) and thicker at the bottom. From what we observed the clay that he uses is quite good, which he bought from a producer at Rawasari Hill, just a few kilometers from his kiln. He used a machine for mixing the clay, and the mixture looks fine, although we still found some bricks that were not mixed well. The size is much smaller than the ones in Padang, similar to the ones in Lhokseumawe but a bit thinner (3.5 x 10 x 16 cm). 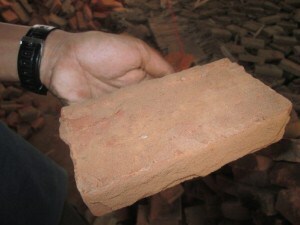 We brought one of his bricks to be tested in our office in Padang. There are around 5 kilns in this village. According to the brickmaker we interviewed, however, there are around 40 kilns in neighboring Kuta Pangwa village, where we visited the day before. We spoke with Erlilawati, one of the homeowners in Jie-jiem village. When the earthquake happened in the early morning, her husband woke up and quickly brought 4 of their children out of the house while she covered her twin babies while the walls began to collapse around her. The wall collapsed on her, and she suffered a spinal cord injury as a result. 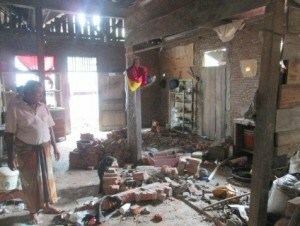 Her husband came back into the house to help them escape, but unfortunately more of the house collapsed with him inside. Luckily, some neighbors quickly got them out of the house after the earthquake stopped. In the morning we went to the Pidie Jaya District to meet with the head of the district’s Department of Education (DP). 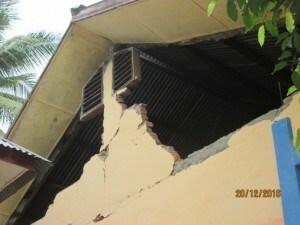 On our way there, we observed some damaged buildings, most of which had suffered wall, column beam, and roof collapses. We met with representatives from the Ministry of Education, UNICEF, and Save the Children. They are collaborating to build 13 emergency school buildings. They are currently completing structural assessments and intend to complete the construction by December 25, 2016, as requested by the President. The designs have been prepared by the Ministry of Public Works. 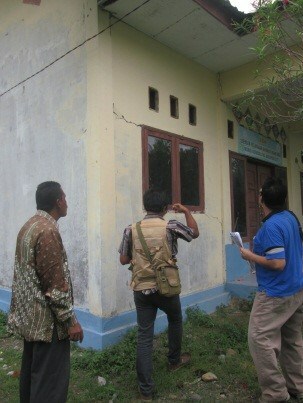 We then assessed four schools in the Trianggadeng sub-district, which is one of the areas that was most affected. Three of them are comprised of confined masonry buildings, and one of them has a timber frame and wood panel building. One of the confined masonry schools that we observed is badly damaged, while the rest sustained moderate damage. Common damages that we observed are collapsed gable walls, wall cracking near windows and doors, and separation between columns, beams, and walls. 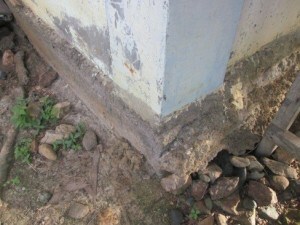 We also observed poor quality concrete made of brittle, round gravel. 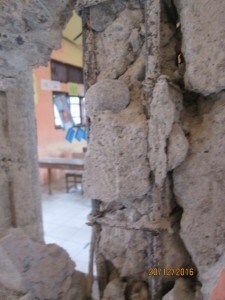 Exposed rebar on the concrete frames is old and rusted. The bricks are also of poor quality. Most of the roof framings are made from timber, but two buildings have steel frame roofs. At the end of the day, we visited Kuta Pangwa, the most affected village in Trianggadeng district. It is near MTSN Pangwa, where we visited on Day 1. About 90% of the houses in the village sustained wall and roof damage. All of the confined masonry buildings, which make up a majority of houses, were damaged. 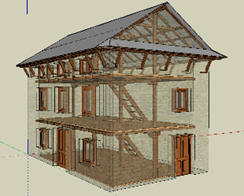 Timber frame buildings make up about 15% of houses, half of which were also damaged. 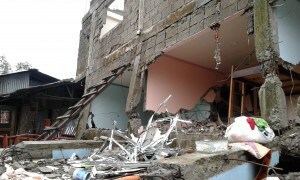 17 people were killed in the village as a result of wall collapses. According to residents, only around 9 houses sustained minor damage, while 110 houses sustained moderate to severe damage. Many affected homeowners are living in tents outside their houses because they are afraid to go back inside. Building materials are relatively easy to come by. Sand is sourced from a local river, and there are brickmakers that work near the village. We intend to visit the brick kilns on Day 3. Timber, while readily available, is more expensive than brick. With regard to reconstruction planning, all homeowners are currently waiting for the disbursement of government subsidies. Some homeowners prefer to build their homes by themselves or with hired builders. Others prefer to be given the finished product instead of money because they fear that they will spend the subsidy on daily consumption. The majority of village residents are farmers, and a few of them have side jobs as insurance agents or shop owners. Our reconnaissance team is composed of 3 Build Change staff and our driver Danu. Danny is the technical team leader for our current better brickmaking program in Lubuk Alung, West Sumatera. She also led the technical team in our previous technical assistance program in Aceh Tengah in 2015. Elwahyudi is a technical supervisor who is also currently involved in the better brickmaking program with Danny. We left Sunday at noon from Padang and flew to Medan. We then drove for about 10 hours to Bireuen, one of the three districts that were affected by the earthquake on December 6th in Pidie Jaya. There is no damage in the city and we saw no wood framed buildings. We went directly to Samalanga sub-district, the most affected part of the district, which is about 1 hour from the city. Here, we started to observe several wood framed building types, although confined masonry buildings are still dominant. We met the Head of BPBD Bireuen and received information on specific villages that have a lot of damaged houses. Two people were killed in Bireuen, caused by cabinet and boards that collapsed on them. 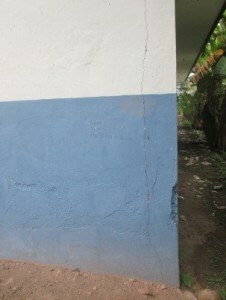 We visited three schools in Bireuen, two of them are side by side and show little damage. 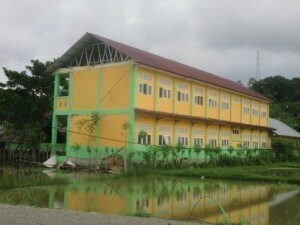 The third was three-story religious boarding school (school-pesantren). All the three schools are masonry buildings. The third school we saw has sustained more damage as the column and beam are separated. Unfortunately, they lost one of their teachers during the earthquake. No timber framed school buildings were found in Bireuen. We then visited Glumpang Bungkok, the most affected village in Bireuen where BPBD reported there are 76 damaged houses (15 of them are heavily damaged). There are 77 resident families in this village. 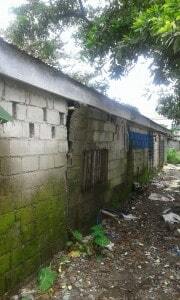 When we arrived, we did not immediately see damaged houses, as several of them are badly damaged inside. Around 70% are confined masonry houses in that village, while others are timber frame with wood wall panel and timber frame with infill masonry. We also found several houses with timber frame upper levels and confined masonry at ground level. 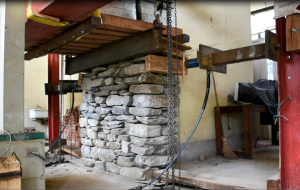 Generally, the timber frame ones were constructed much earlier (30-40 years ago) and then the confined masonry was added below at a later stage (10-15 years ago). 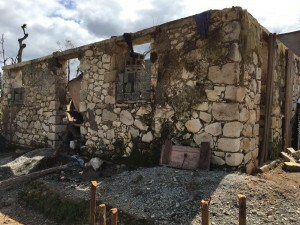 Most of the damaged houses, about 90% of them, are confined masonry, although we also observed the timber columns of some timber framed houses shifted from their footing. 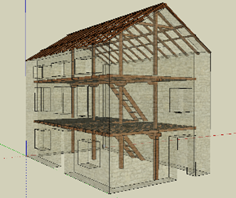 All houses use CGI roof and timber roof framing. In total we assessed 11 houses, 3 of which are badly damaged. 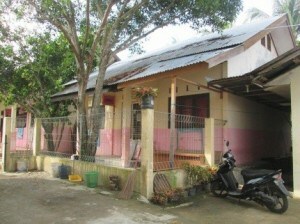 We also interviewed some homeowners, builders, and the village leader (Kecik). 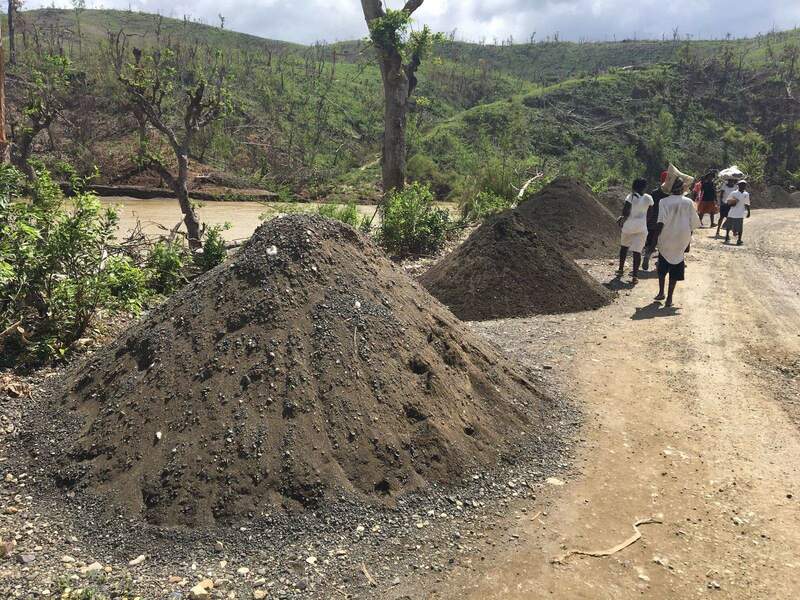 Building material such as sand and gravel are widely available since they said they can take them from the river nearby. But for bricks, cement, and other manufactured materials, homeowners need to order from the city which is about 2 hours away. The area is luckily not a tsunami-zone. 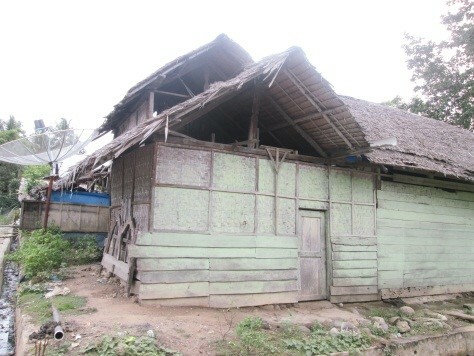 The Kecik is unsure when reconstruction will begin, as they are still waiting for government’s subsidy. At 5 pm we headed to Pidie District (Sigli). 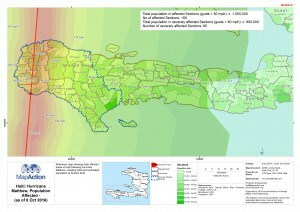 Pidie Jaya District is the most affected area is between Bireuen and Pidie. As we left the Bireuen area, we immediately began to see more badly damaged houses and buildings. We stopped at one open space where we learned that the building that had once stood there had collapsed during the earthquake and killed 9 people. 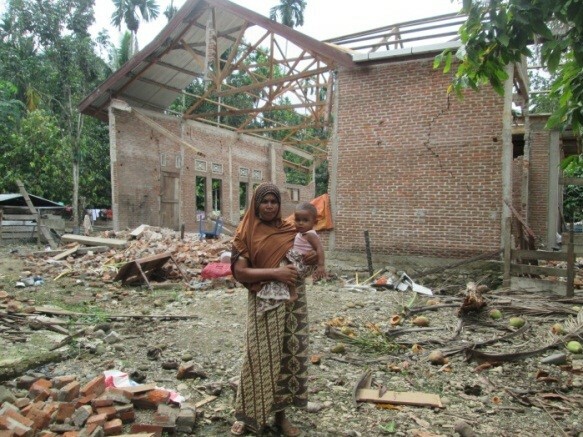 We visited another heavily damaged school in Pidie Jaya District. It is comprised of 4 buildings, all of which are confined masonry, and one building is two stories. There are a lot of structural damages including cracked walls and floors, but no collapse except for ceiling and lighting fixtures. 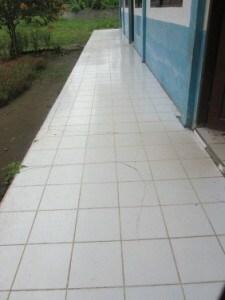 The school is just around 2 km from the coast line and is located in a tsunami-zone. The emergency response period has been extended until December 27th. We spoke to Muhammad Abdul Karim, whose house in Gumplang Bungkok village was highly damaged during earthquake. He, his wife, and their three children were asleep in one bedroom when they started to feel the shaking. Abdul was frightened- not only was the shaking was so bad that they couldn’t stand, but he also heard loud noises like things were crashing and collapsing outside their bedroom. He thought that day would be his last. He and his family just kept hugging each other. Fortunately, they were able to go out of the house safely after the temblors stopped after about a minute. Abdul got a minor injury on his leg, stumbling through the collapsed bricks. 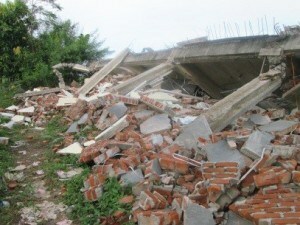 Around 70% wall of their brick house collapsed. The wood roof structure, however, is still fine. Currently, 13 days after earthquake, he and his family still do not dare sleep inside. Now, they live in their family’s house in the same village. He and his family only return to their house in the daylight. He has started to install some used wooden panels to replace the brick walls that collapsed. Abdul remains unsure about when he will have courage to stay in his house again and start to build his home back. Today we visited the city of Beaumont located between Jeremie and Camp Perrin in the mountains. We met the Mayor of Beaumont, who described a similar situation as that in Moron. 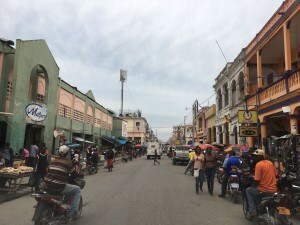 The main street of the town was not very affected by the hurricanes. The majority of the houses and commercial shops are made from unreinforced masonry with heavy roofs. We went with a municipal agent to visit the outskirts of the town. In this area, ­ 80% of houses were made from wood frame and stone masonry infill and 20% were constructed from unreinforced masonry. We saw again here that wood framed houses are much more damaged. The stone masonry is unable to resist the wind force, and we did not see wood cross bracing in the walls. People who lost their home are either staying in an unreinforced masonry school or building makeshift shelters on their property. We asked the construction date of these houses while interviewing the homeowners, usually they do not remember the date as they are more than 30 years old. Most foremen are not building with wood frames anymore and the skills have been lost throughout the years. New houses are built from unreinforced masonry blocks. Picture of wood frame and masonry infill houses destroyed in Beaumont. The homeowner used old CGI to make a shelter next to the site of their destroyed home. We visited two schools in Beaumont. INFODIH is a primary school made from unreinforced masonry and with a wood truss system for the roof. 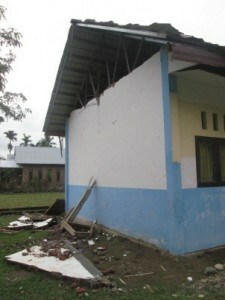 The school was badly damage by the fall of the masonry gable. The pieces of block gable broke some wood truss element and let the wind enter in the classroom. As the other part of the roof did not suffer severe damage once can argue that the roof sheets were blown away after the gable roof fall. Fortunately, the school was not used as an emergency shelter during the hurricane. The wood truss elements were well connected with gusset plate on both sides, but the roof-to-wall connection consisting of bent rebar wrapped around the truss rafter seemed insufficient. 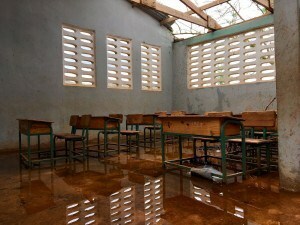 The school is currently shut down and the school materials and furniture are subjected to the elements. Ecole National de Beaumont, without roof. 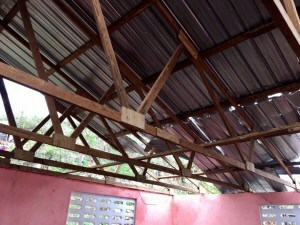 We visited the National School of Beaumont and unfortunately the roof damage is severe. 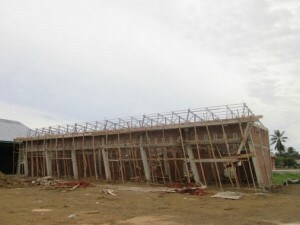 The six classrooms do not have a roof anymore. 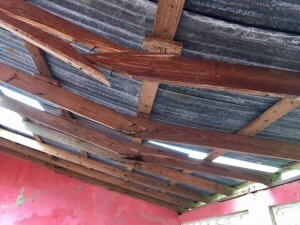 The structural system used for the roof – 2×4 rafters spaced at 1m – is insufficient to resist the wind force. The rafter-to-rafter connection was done poorly and the failure occurred at this weak point. The connection of the rafter to the top of the masonry gable was insufficient, and the wood elements were pulled away from the wall allowing pieces of the masonry gable to fall. The schools of Beaumont that were not damaged by the hurricane are being used as shelters for the families who lost their homes. There is no school running in Beaumont currently. 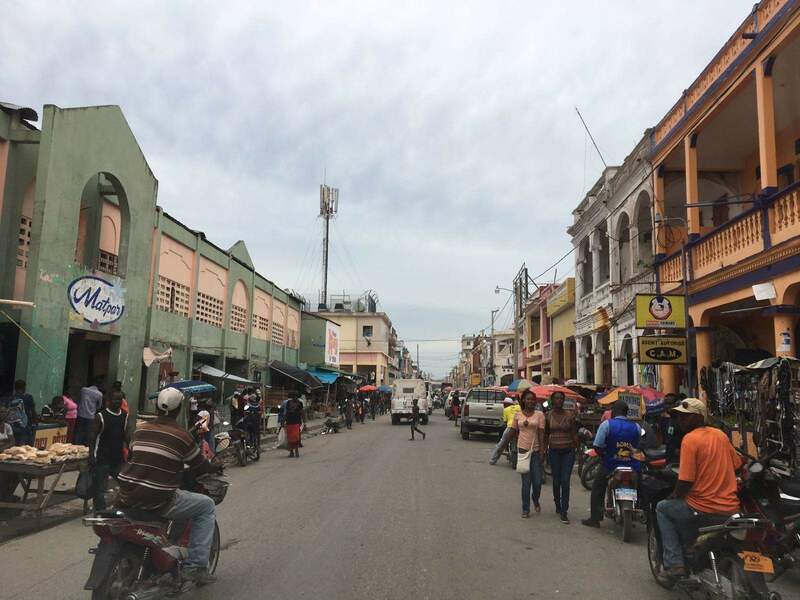 We arrived in Les Cayes in the afternoo, a major city on the southern coast of the island. The city was flooded for days after Hurricane Matthew as the rain had continued to pour. The city center is full of trash and debris, but the majority of the buildings were in unreinforced masonry and were able to resist the strong winds. The majority of light weight roofs have been blown away. We visited an informal settlement that was dramatically affected by the hurricane and the floods. The structure of the houses have been soaked in water for days and the structures are in really bad condition. The sanitation situation in this zone is a severe concern due to high population density of the neighborhood, the amount of trash and clogged drainage. Today we drove from Jeremie toward the mountains in the middle of the Grande Anse department. On the bumpy road along the Grande Anse River we saw dozens of houses with heavy damages from the hurricane. 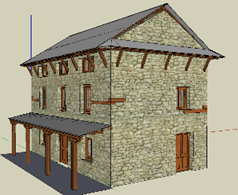 The houses are mainly constructed with a wood frame and stone masonry. The wind force shocked the buildings, provoking the fall of the top corners of some walls and cracks near the column joints. The use of mud mortar to place the stones is insufficient to tie the stone together well. We saw houses that withstood the hurricane better when they were plaster with cement mortar. Foreman are using untreated wood to build the frame with a spacing of typically 1m. The wood elements are not saw lumber, but generally round wood approximately 7-10cm diameter. 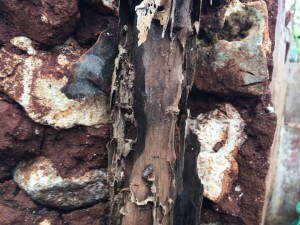 On the most damaged houses we saw that the wood was deteriorated by termites and humidity. The great majority of houses in unreinforced masonry have little cracks, but many have lost their roofs as they were poorly connected to the top of the wall. For this type of building, the wall-to-rafter connection is typically a piece of bent rebar around the rafter. We observed failure of block masonry walls when the span of the wall was more than 4m without a ring beam. Retrofitting would be an interesting solution for these buildings, and would involve adding a ring beam and columns at the corners. Nevertheless, the quality of the blocks should be investigated thoroughly, as they appear to be very fragile. We saw a few houses built with stone masonry that behaved well, but the connection to the roof failed and the roof was destroyed. We arrived in Moron, a town located on a hill surrounded by mountains and not far from a large river. All the trees around the town are destroyed. We had a talk with the Deputy Mayor, who told us that even if the situation in the city center – where about 90% of the lightweight roofs were blown away – appears critical, the situation in the communal sections 2 and 3 was even more dramatic. These two sections are located on the other side of the river, and the cable bridge crossing the river has been severely damaged by the hurricane. People have to cross the river by foot in order to access the market. In these areas, the houses are built from mud and wood. The Deputy Mayor considers the town completely destroyed. 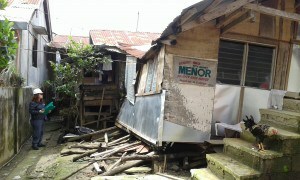 We assessed a few dozen houses in Moron to understand the type of failure and extent of the damage. 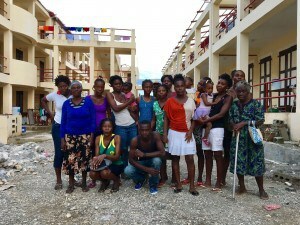 We met with Samedi Camecise, who lost her house during the hurricane. She described a sudden, total collapse of her house, after which she and her son found shelter in a neighbor’s house made from unreinforced masonry. 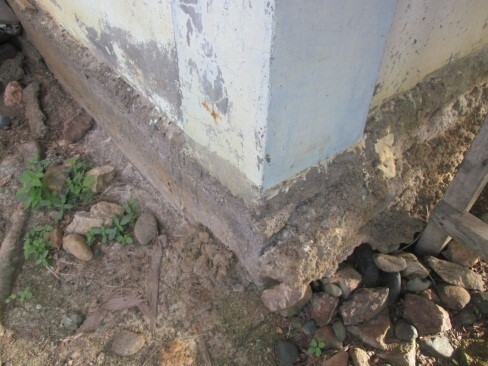 The quality of construction materials is a major challenge in the area. We saw pile of sand extracted directly from the river bed. The sand is sold without being washed. The block quality is very poor as many manufacturers put clay in blocks. The CGI are mostly substandard, and were deteriorated and rusted before the hurricane. We interviewed people about their knowledge in quality material selection and it appeared that they have little knowledge due to lack of training. 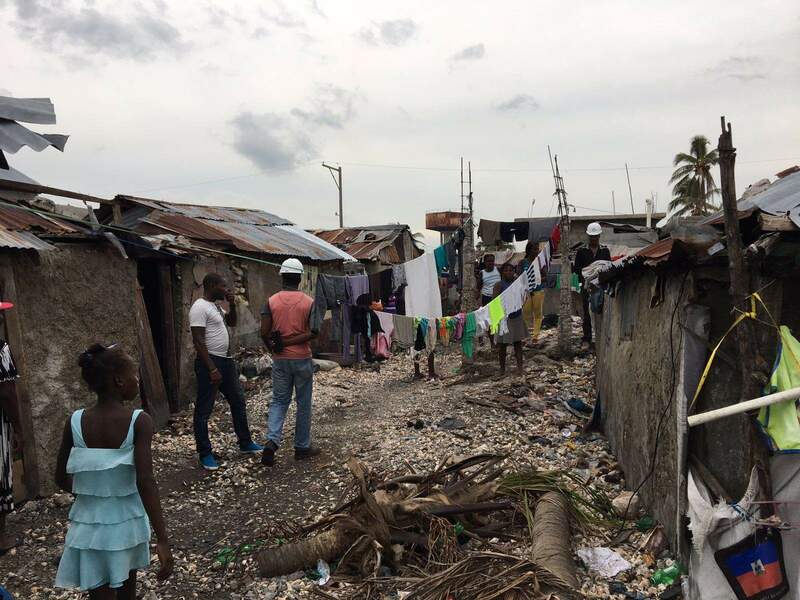 We surveyed material shops in Moron and Jeremie and found that the materials are generally available in the cities but very scarce when not accessible by the road. The Build Change reconnaissance team for the South and Grande Anse departments is composed of 4 engineers and our driver Ken. Junior is a team leader who has extensive knowledge in retrofit and new construction in confined masonry. Gaspard is the program manager for our current retrofit and reconstruction program in Port au Prince. Herode is a trainer from the block department. Clement has been a project engineer for 2.5 years in Haiti working on house and school retrofits. We drove from east to west so we were able to see the evolution of the effect of the hurricane. 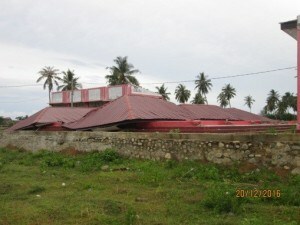 In Miragoane numerous trees had broken branches, but the vast majority of roofs withstood the winds. In Saint Louis du Sud we started to see broken trees and houses with severe roof damage. Some electrical poles fell, cutting off electricity to the city of Les Cayes. We passed through the city of Cavaillon which was flooded last weekend. 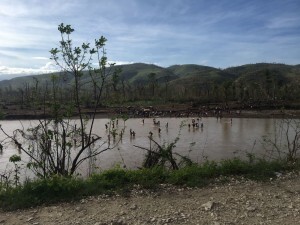 After Les Cayes, we took the road toward the north and the mountains. It was striking to see how the landscape had changed. 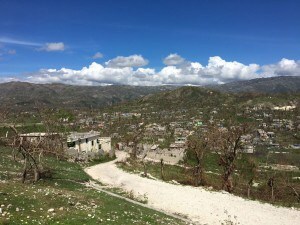 This region is known for being one of the greenest areas in Haiti, however now all the trees have lost their leaves and most of them have fallen branches or are completely broken. We passed nearby the city of Camp Perrin which was heavily hit by the hurricane. The city used to be hidden by the trees from the road (see picture). As we continued toward the north we saw that the type of building was changing. There are less and less confined masonry houses and more wood frame with stone masonry infill or mud houses. The houses with heavy roofs do not show severe damage, however the hipped roofs are heavily damaged. One detail that’s worth noting is that some houses with straw roofs are not heavily damaged – only parts of the cover are gone, but the structure is preserved. We drove around the shore toward Jeremie where many houses, more than 80%, are heavily damaged. Many roofs are gone and the walls show cracks or are completely collapsed. Most of these houses were built with wooden roofs and a wood structure with infill masonry or wood panel. We arrived in Jeremie at midday and we met the general secretary of the mayor’s office of Jeremie, Antoine Dimanche, to introduce Build Change and describe our evaluation work. M. Dimanche proposed that we visit and evaluate the Vocational School of Jeremie, where the roof was blown away by the hurricane. We met Robert Jean Louibert, one of the professors and deputy director at the school. 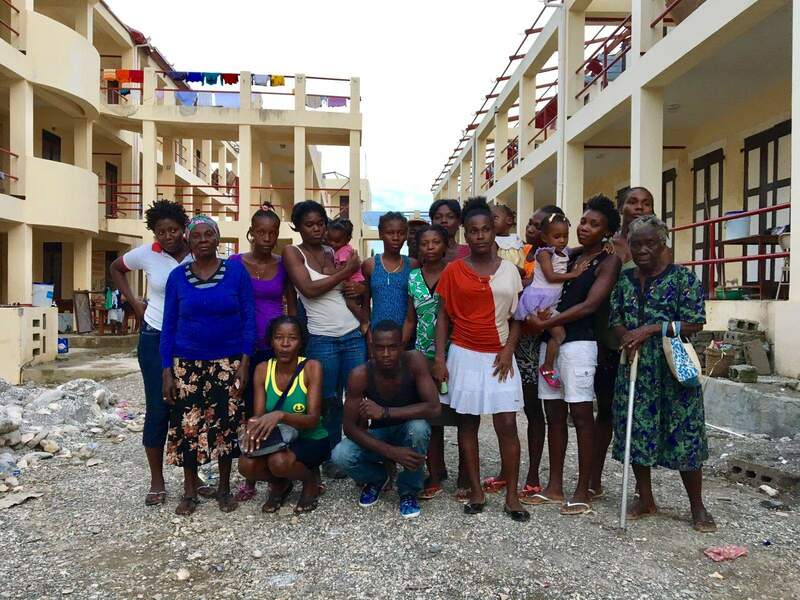 He explained that the school was training 400 students in different vocational skills such as construction, metal work, electricity, hair dressing, and wood work before the hurricane. Now the courses have been suspended, and some parts the building are being used instead to accommodate 104 families who lost their houses. The structure of the school is safe, but the covering of the roof (comprised of metal or wood truss in different sections) is completely damaged. We spoke with Rose Darlene who lost her house in the hurricane and is now staying in the school. She is selling small food items to make a little money and begin to recover from the storm. M. Louibert told us that he would like to reopen the school as early as November, even though the challenges of recovery seem extensive. We have also completed an assessment of the police station and fire station. The fire station has no damage, but a portion of the roof at the police station was constructed from wood truss and is completely damage. In addition, we assessed the houses of OAS/Estrella next to the office of MTPTC. The houses are built from confined and non-reinforced masonry. The structures are safe but the roofs are either completely damaged or gone.